When did Halloween become a season? At some point since I became a father, Halloween seems to have transformed itself from a holiday into a season. At my house, the costume planning for my two grade-schoolers starts early. The good news for me is that whatever is invested in costumes (this year, my wife made the costumes) is now at least spread over multiple Halloween parties and events throughout the month of October – school, Girl Scouts, neighborhood kids’ events, and more. 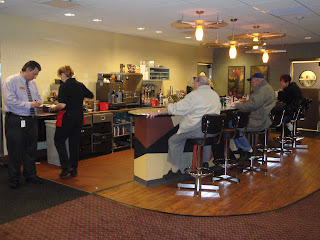 At Eat’n Park, it has become a big deal as well. Our Halloween Smiley Cookie is our most popular cookie each year. Last year, our famous orange Smiley Cookie even found its way into a nationally released DVD kids’ movie, R.L. Stine’s The Haunting Hour: Don’t Think About It (the cookie appears in about 15 scenes in the movie, including being eaten in a sight gag by one of the stars) The movie featured two of the actors from Hannah Montana, Emily Osment and Cody Linley, which definitely upped the Halloween Smiley Cookie on the coolness meter for my kids. This year, we’ve expanded the Halloween Smiley Cookie brand to include Halloween Smiley shoe charms (they fit into Croc brand shoes) and Halloween Smiley t-shirts. The shoe charms are available at all Eat’n Park locations, and the Halloween Smiley t-shirts are available at select Eat’n Park locations (click here to see which ones) and in our online store. 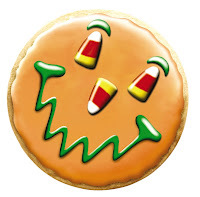 Of course, you can still find Halloween Smiley cookies at all Eat’n Park locations or send them to friends and family across the USA at http://www.smileycookie.com/. So, enjoy the season and have a happy and safe Halloween! For the last five years, I’ve been working toward a goal that has finally come to fruition: all of Eat’n Park’s milk is now free from rBST/rBGH hormones. By eliminating these hormones, we wanted to preserve the natural credibility of our milk supply and continue to deliver a high quality product. This was not an easy task, but the farmers we work with made the change because natural milk production poses fewer health risks to their herds and will decrease the expense on medication for treating the cows. To give you a little background, Bovine somatotropin is a naturally occurring hormone in cattle that regulates growth and milk production. When it’s produced artificially by genetic engineering techniques, it’s then called recombinant bovine somatotropin (rBST) or recombinant bovine growth hormone (rBGH). This hormone is administered at the farm level, and it in turn increases milk production. However, there are certain drawbacks to using rBST/rBGH (click here for more info: http://www.centerforfoodsafety.org/rbgh2.cfm), and for us, these outweighed the benefits of continuing to use the hormones. To convince our partner farms that eliminating rBGH/rBST was the right thing to do, I strapped on my work boots and started visiting dairy farms in and around Western PA with Chuck Turner. Chuck is the owner of the family owned and operated Turner Dairy Farms (http://www.turnerdairy.net), which processes all of the milk that is produced by the other farms that we buy from. Chuck and I visited farms large and small – some with 30 cows, and others with 300 - most of which have been in the same family for more than three generations. After discussing the potential consequences of using artificial hormones and the benefits to eliminating them, these farmers understood why we wanted to buy milk that was free from rBST. Side note: It was so cool to see how progressive some of our farmers were. One of them had a Palm Pilot that included all of the names of the cows, how many calves they birthed, and how many pounds of milk they produced per milking. Another was using a mixture of cow poop and other organic material to produce gas to heat their barn and house.I’m happy to report that my visits were a success! After completing the farm visits, not only did I understand dairy farming a little more, but I was also confident that our fluid milk was coming from local farm families that have chosen not to treat their herds with rBST. We’re fortunate to have suppliers who are willing to work with us to produce the highest quality products. And on that note, because of their relentless focus on quality, Turner Dairy was recently awarded First Place for Best Tasting Milk at the World Dairy Expo. Just one of the reasons that we have, in my mind, the best milkshakes anywhere!! Congratulations, Chuck and Turner Dairy! Every day, our dedicated team members in guest relations receive calls and emails from curious guests seeking information about Eat’n Park that isn’t listed on our website. Well, in this posting, we’ve compiled some of the questions we hear most frequently. Of course, we know there are more questions out there. What else do you want to know about Eat’n Park? We’d love to answer any questions we haven’t addressed here. Please, leave us a comment so we can gratify your curiosity! Q: Why “Eat’n Park”? Wouldn’t “Park’n Eat” make more sense? A: Park’n Eat would have been a logical choice, but here’s the thing: Back in 1949, when our first restaurant opened, the term “park and eat” was as common as “drive thru” is today and couldn’t be copyrighted. So, to stand out, our founder reversed the words, and the rest is history. Q: I have food allergies. Are Smiley Cookies safe for me to eat? A: Smiley Cookies contain the following allergens: wheat, soy, egg, and milk. It’s also important to note that while the cookie itself does not contain any nut products, these allergens are present in our restaurants, where the cookies are iced and baked. Q: What steps is Eat’n Park taking to “go green”? Q: I signed up for your email club. Why haven’t I received my coupon? If you signed up on our website, your coupon was probably emailed to you within 24 hours. However, it might be caught in your spam or junk folder. Make sure you check these folders, and then add our email address to your safe senders list so that future emails are delivered to your inbox. If you're sure that the email isn't caught in your junk folder, go here to notify us so we can investigate for you: http://www.eatnpark.com/feedback_request.asp?RequestType=General. Make sure you include the email address you registered with. Q: My non-profit organization is having a fundraiser, and we’re looking for donations. We’d like to have Smiley cookies donated, but your website says you need 5 weeks notice. Why do you need so much time? After this decision-making stage, we have to get in touch with everyone who’s been approved, then coordinate the details about when they’ll pick up their donation. Then, we need to communicate with our restaurant managers two weeks before the donation will be picked up, so that they have time to order the supplies needed and prepare the donation for the pickup date. When you multiply these steps by the number of requests we’re dealing with, you can see why we need so much time. 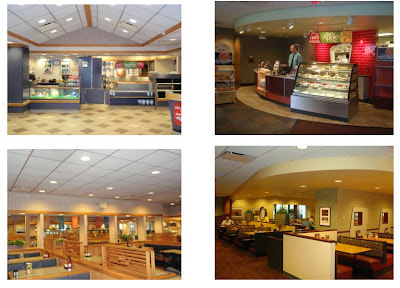 Lately, instead of opening new locations, we've been focused on remodeling existing Eat'n Park restaurants. Our most recent project has been our Monroeville location, which we've given not only a facelift, but also a brand-new feature: our first pick-up window, which opens this Friday, October 10. We're really excited about the level of convenience we think this will add to our guests' takeout experiences. No more having to get out of the car, only to wait in line to pay inside the restaurant. With this feature, guests will be able to call the restaurant to place their order (412-471-1111, by the way), then just drive around to the pick-up window to pay for and receive their meals. Below are some cool before & after shots from our VP of Design and Construction, Andy Dunmire. In addition to the new pickup window, Andy and his team also added counter seating. If you've had a chance to check out the changes at the restaurant, or if you've tried the pick-up window for your takeout order, please post your comments here and let us know what you think! Meet Our Menu Development Team at Good Taste Pittsburgh! Here’s your chance to meet the culinary team behind the Eat’n Park recipes you love (and sample some great food while you’re at it)! On October 18th, we’ll be cooking up a storm at this year’s Good Taste! Pittsburgh Food and Cooking Expo at the Pittsburgh Expo Mart. You can catch me and John Frick, our Executive Chef of Menu Development, at the “What’s Cooking” stage from 11:00 to noon. Watch us recreate two of our favorite Eat’n Smart selections, Baked Lemon Sole and Rosemary Chicken, right before your eyes. Best of all, you get to sample the two dishes! Be sure to print this coupon to receive $3 off admission at the door. Our Rosemary Chicken is a guest favorite and it’s easy to make at home. So for those of you who can’t make it out to the event to see us prepare it live, here’s the recipe - I think you’ll enjoy it. Drizzle the chicken breast with olive oil and season with the rosemary and black pepper. Bake 450° for 6 to 10 minutes until reaching an internal temperature of 165° for 15 seconds. You may also grill or sauté the chicken breast. Sautee the mushrooms for 2 to 3 minutes until they are tender. When the chicken is cooked, place it on the serving plate and top with the cooked mushrooms. Top the mushrooms with the Beurre Blanc sauce. Garnish the sauce with the chopped parsley. Combine the wine, vinegar, and shallots and boil over a medium heat. Reduce to 3 tablespoons of syrup. Add the cream, salt, and white pepper and continue to boil for 1 minute. Reduce heat to low and add the butter one tablespoon at a time, whisking constantly. Pass the sauce through a mesh sieve to remove the shallots. I’m hoping to see you at Good Taste Pittsburgh! And if you tried making the Rosemary Chicken, please return to our blog and let me know how it turned out.